Have you noticed that bowls are the big thing right now? Quinoa bowls, smoothie bowls, sushi bowls, super food bowls, Buddha bowls. They’re a thing. And probably for good reason. Bowls are basically taking the concept of a salad bowl and putting whatever the heck you want into it. 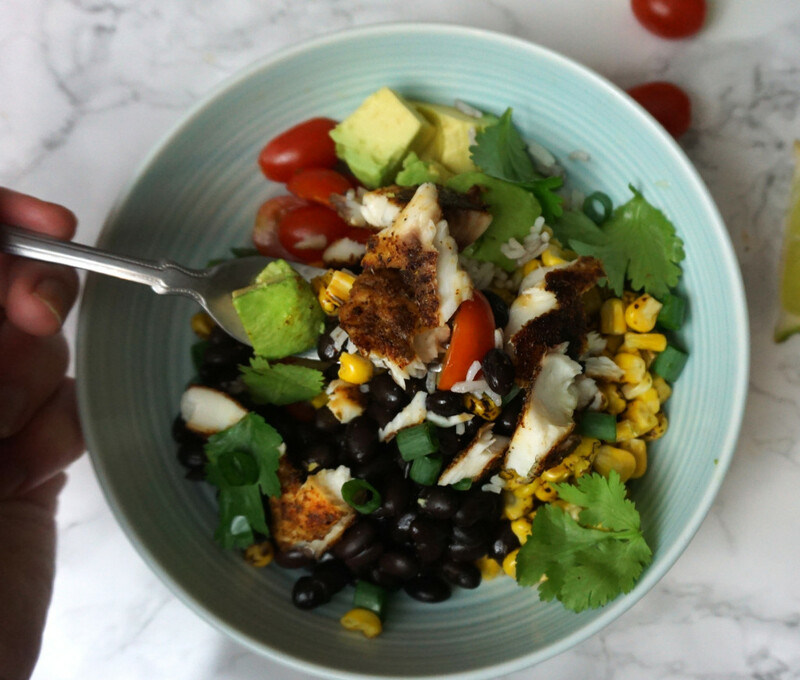 When I made this I was craving something Mexican-y but wanted to stay somewhat healthy. That’s what led me to this Tilapia bowl. This bowl is basically a deconstructed burrito without the tortilla or massive amounts of cheese. And the tilapia is lighter than beef or pork. There are really no rules when it comes to this recipe as long as you stick to the flavor profile. You could add salsa instead of the tomatoes or guac instead of the avocado. For the fish I wanted a “blackened” look, so I basically just went nuts with the spice rack. If you don’t have everything that I used it’s no biggie. 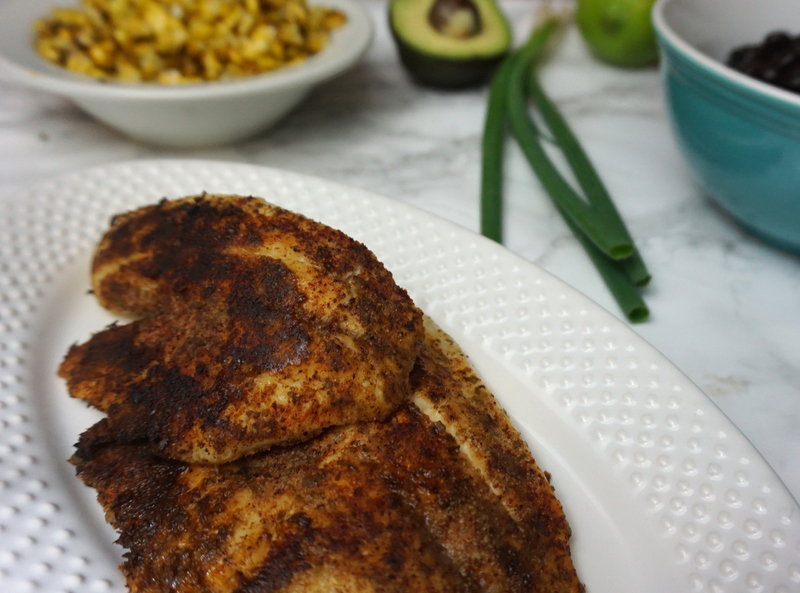 The key is to be sure the tilapia is well spiced as it doesn’t have a lot of flavor on its own. I felt very Californian eating this dish. 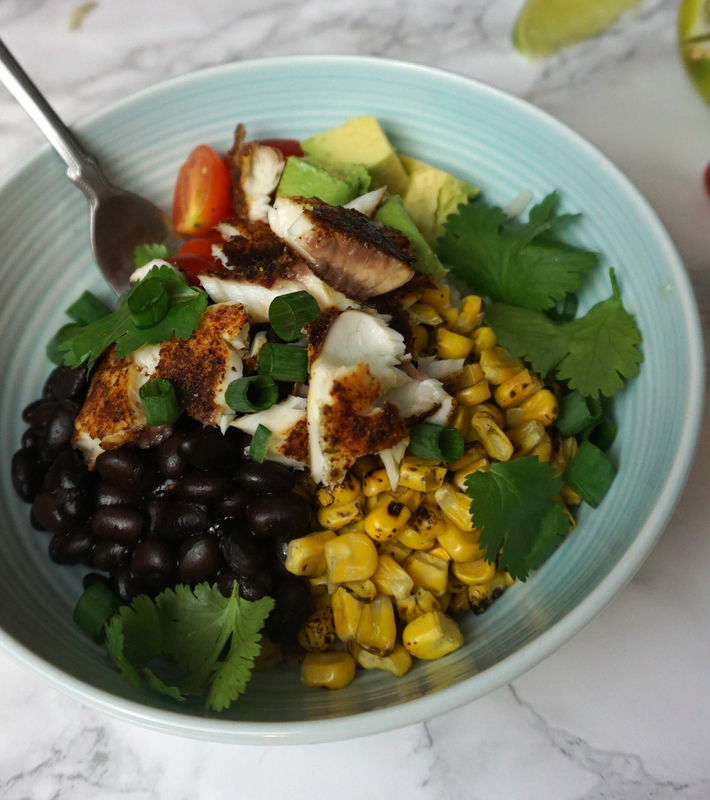 I loved how fresh this was with the lime, cilantro and avocado – yum! It would be an awesome summer recipe. I served this with Basmati rice, but you could use jasmine or brown rice instead – or even quinoa would be great! If you wanted to low carb it then you can omit the grain aspect of this. There’s a place by my work that does a sushi bowl that’s amazing. I need to eat it at least once a week. I’m not quite comfortable preparing raw fish at home yet, but next time I definitely want to go the Asian route with this concept! Preheat the oven to 375 degrees F (190 degrees F). Grease a 9x13 inch baking dish. Place the tilapia fillets on baking sheet. Bake for 25 minutes until fish flakes easily with a fork. Warm drained and rinsed black beans and heat for 1 minute in microwave or on the stove until warm. 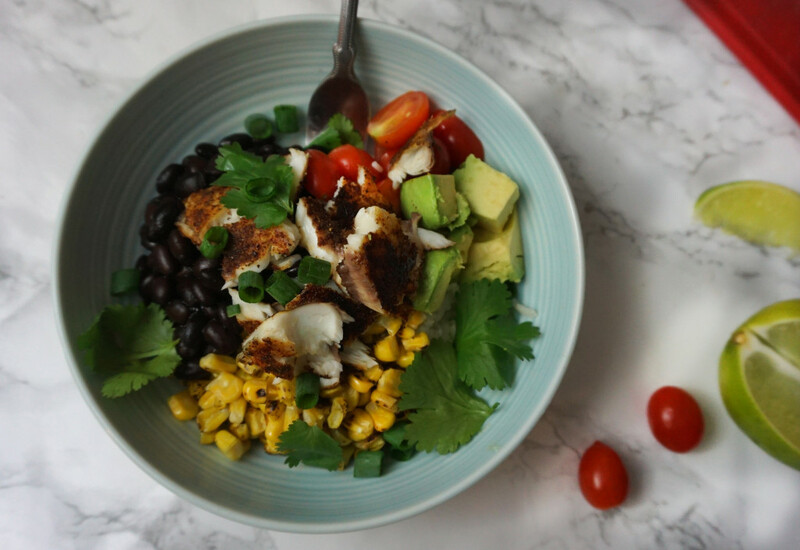 To serve: Add ⅓ to ½ cup rice to a bowl and top with the corn, beans, tomatoes, pieces of blackened fish, diced avocados, and any toppings you desire. Sprinkle with lime zest. Top with cilantro and green onions is desired.